When you import data into your system and Performance Alerts are set up for the data that you are importing, these will be fired if any of the Performance Alert criteria is met. Previously, there was no way to turn off Performance Alerts without having to actually disable the performance alerts prior to the import. Now during the import you can select that the alerts are not fired. When you import data into the system you need to upload the file and Map across the usernames. 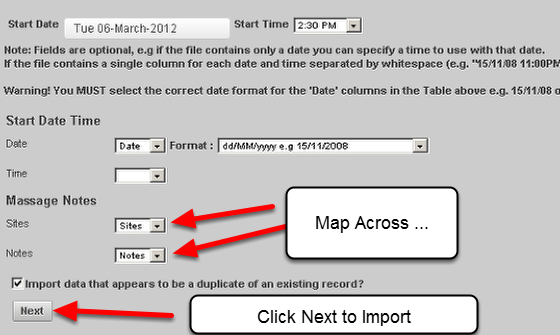 Then, you need to map the date and data fields (as shown in the image here). Click Next to Import in the information. You may be importing in historical data. This data is NOT current and users do not need to be notified, so you would select to skip the alerts. If you are importing in data that is current and users need to be notified of this information, then you would select that the alerts are fired. If you select Trigger any performance alerts that match this imported data then all performance alerts set up for this Event Form will be triggered and sent to the appropriate users. You can see here that when the user selected to Trigger the Performance Alerts they were sent and were on the system to view.